Today is the MLB trade deadline and holy crap, it’s been insane. It’s 1pm (central time), so there’s still a little time left, but there’s already been major moves, most of them centering around the Red Sox. I was honestly hoping that the Sox would hold on to Lester and get a contract deal done by the end of the year. He was easily our #1 starter and the loss stings. On the flip side, the acquisition of Cespedes is insanely good. There was no way I thought the A’s would part with him. The Red Sox needed help in the outfield, desperately and went out of got it. The real question is, after the rental of Lester to the A’s, would he be willing to come back? Having Lester and Cespedes in 2015 would clearly be better than Cespedes alone, but they’re going to have to throw crazy money at Lester to do it. Does getting traded sour Lester on Boston in general? That remains to be seen, but in my mind he’s gone for good. Losing Gomes as well would have been bad without a replacement, but Cespedes more than makes up for any production loss. So, essentially, we upgraded left field but lost an ace, who was going to be a free agent anyway. Food for though, Cespedes has out homered the entire Red Sox outfield, combined, this year. I’ve never liked Lackey, there, I said it. Something about his mouth-breathing weirdness, I don’t know, he just never really impressed me. He wasn’t going to pitch well next year, he looked like he had given up. He was talking retirement rather than make the league minimum on this extension/club-option year. Getting anything more than a bag of balls for him was a win-win. It gives the Cardinals a mid-rotation guy that has post season experience while giving Boston another bat (Craig) to try and get something working as well as a potential back of the rotation replacement (Kelly). IF Kelly works out, he’ll be joining a whole platoon of young pitchers from Pawtucket. Best of all, since we’re clearly abdicating this year, you can let them all get some big league experience. Webster, Barnes, Wilson, Workman, De la Rosa, now Kelly. Let’s see what the kids can do! Final review – A-. Lackey was done. Getting something for nothing works for me. Yes, this happened prior to today, still counts. I liked Peavy, and I know he liked Boston (he even bought a Duck Boat), and he was great in the post season, when we needed him the most, but something never really fit. He never got any run support, he never really endeared himself to fans. If we had gotten Peavy 4-5 years ago, I would be more upset, but it seems like he might be past his prime, he’s getting ready to retire as well. Getting Escobar (a starting pitcher) who’s just on the edge and ready to be brought up and Hembree (relief pitcher) has a lot of upside coming out of the bullpen, was certainly better than just letting Peavy walk after the season. Hmm, initially I didn’t like this one. I really really liked Miller. He’s a solid, proven, highly valuable, left-handed reliever. I’ve never heard for Rodriguez. The only thing that slightly changed my perspective is that Miller was going to be a free agent. It had been reported, multiple times, that Miller liked Boston and wanted to resign. So, the question is, is this another rental? Will Miller want to come back? What did we get in return? Apparently Baltimore’s #3 prospect, although the numbers don’t really bare that out. He’s 3-7 with a 4.79 ERA in Double-A. I don’t really understand how that’s a good deal. Miller was dominant. I hope, pray, that they “know” that Miller will resign in the off season, otherwise this one is a loss. Who in the hell is Kelly Johnson? Doesn’t matter. Steve Drew is gone! Huzzah! Getting anything more then a bucket of popcorn for Drew is a huge win. The Red Sox are a better team today than they were yesterday. Yes, they gave up pitching, but they were potentially losing FOUR of the pitchers at the end of the year anyway. Getting anyone, let alone several solid pieces, in exchange is kind of a best case scenario. In my mind, major league baseball players (and major league “ready” players) are under-valued and low-minor league players and prospects are over-valued. If you can get major league usable players, now, to me that’s better than taking the gamble on prospects who might not work out. Also, not only do you have pieces you can plug in now, you have an excess of prospects you don’t technically need. Those all become trade bait for the off season. If Edwin Escobar never pitches for Boston, but gets traded for someone else who might, that’s not really a loss is it? Way back, probably over a month at this point, Dennis from Too Many Verlanders/Manninghams sent me an incredibly considerate PWE and I have been a complete scumbag in never mentioning it. Life has a funny way of getting away from you like that. I owe him a considerable amount of Tigers cards, which have been accumulating on my desk at home for some time now. 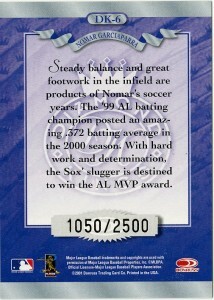 The note that was included in the envelope read something to the effect of: “I found this Nomar at a show and knew I had to send it to you”. That kind of forethought and kindness is what keeps this whole community the highlight of my collecting experience. 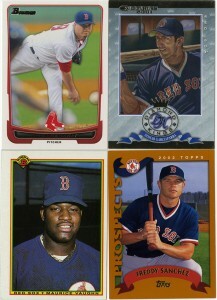 A Lester, a Nomar, a Mo Vaughn and a Freddy Sanchez rookie. That’s quite the combo. Did you know Freddy Sanchez was a 3 time All-Star with the Pirates after Boston traded him for Jeff Suppan? Well, you do now. Aww yeah. Being out of 2500 for a late early 2000’s card is practically like being /100 these days. It’s awesome. Its also a unique addition to my Nomar collection, which is always appreciated. I have a good friend who loves to visit auctions, estate sales, and the like. I’ve told him in the past to keep any eye out for any cards. He’s picked me up the occasional pile of ’87 Topps, but a couple weeks ago he stumbled across someone else’s collection. 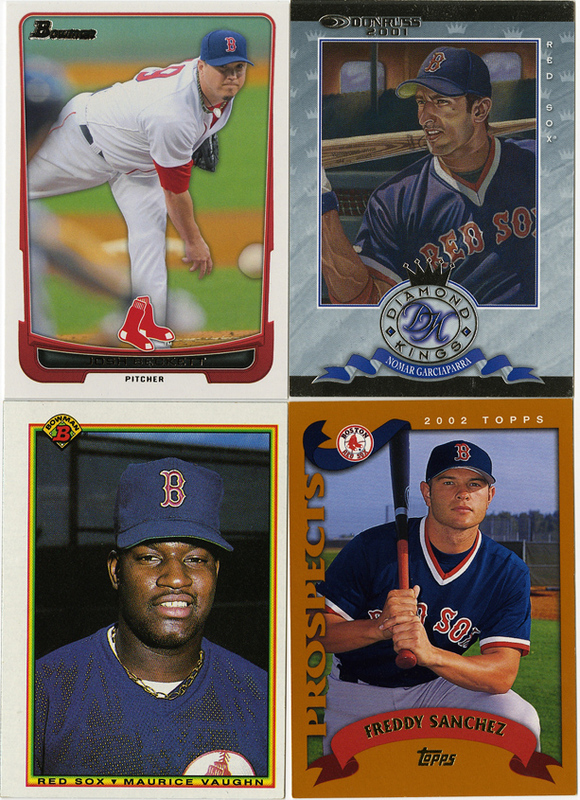 There were several boxes, a complete set of 1992 Donruss, and a few binders. He sent the whole thing my way and I’ve just started to dig into it.